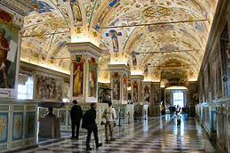 Visit the Vatican museums to see the world famous Sistine Chapel and St. Peter's Basilica. Note: Go early in the morning to bypass the long lines. There were so many people it was a little overwhelming. There were so many people it was a little overwhelming. You should definitely have a guide so you can get through as much as possible in the short amount of time that you have. We did the Vatican, Sistine Chapel and Cathedral in one package. This was absolutely horrible. Yes, we "skipped the lines" to enter the Museum, but once inside, there were hordes of visitors. Not a rewarding experience at all. Not a good investment of our travel dollars. BOORING and crowded. Guide said it was a rather &apos;light&apos; day - usually more crowded. I could hardly imagine!! Unbelievable, esp. the Sistine Chapel. Breakfast in the Vatican and began tour before it opened to the public. Breakfast in the Vatican and began tour before it opened to the public. This is the way to tour! An excellent guide as well. We toured the gardens first. We enjoyed the tour very much. We enjoyed the tour very much. I wish we had had more time to see everything. I bought a good guidebook about rome so I can always get more information later. Viking provided a private tour with a small group at night to this site. Viking provided a private tour with a small group at night to this site. No crowds. Absolutely amazing experience. Did the full Vatican. 4th time there, best guide and tour of all. Yes, lots of walking however great guide and you learn and see more each time you go. Fascinating place full of interesting exhibits. Booked in advance for 7:30 pm Friday evening tour with English speaking guide. It was very informative and was an excellent experience. It was very informative and was an excellent experience. Also organised very well and the tour guide was brilliant. Going to Rome to see the Vatican/ colosseum/ the Trevi fountain is a must! Going to Rome to see the Vatican/ colosseum/ the Trevi fountain is a must! Once in a lifetime tour. Amazing guide in the museum. The driver/ guide was good. He was an excellent driver. Don&apos;t know if I could drive those streets. This was an excellent tour with an extremely knowledgeable guide through Livitaly. We didn&apos;t see it all, but what we did was impressive.Must boom with a group or there is a huge line just to get thru security. Because we booked with Viking we walked right up and had no wait.